Equine Influenza (EI) is a highly contagious disease affecting horses worldwide. If you suspect your horse has EI, call your veterinarian at once. Signs of the disease are coughing, watery nasal discharge that over a period of time thickens, enlarged lymph nodes, lethargy, fever. Treatment for the flu is mainly supportive care. Although food may not tempt your horse for a few days, provide lots of hay and fresh, clean water. Check regularly so that your horse does not become dehydrated. The horse’s stall should be clean and well-ventilated. Keep the area as dust free as possible to avoid respiratory tract problems. Your vet may prescribe Banamine, a medication which can help lower temperature so that your horse feels better. This will encourage the horse to eat and drink. Antibiotics are usually only prescribed if there is a secondary bacterial infection present. Rest is an important part of healing. 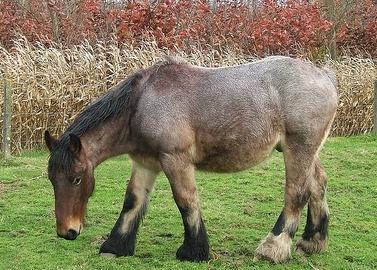 A horse’s normal temperature is about 100 degrees. For each day your horse runs a fever, a week’s rest is necessary to prevent potential permanent heart damage. There is a vaccine against the EI virus. However, since virus strains are unpredictable and change often, the vaccines may not be effective. To help avoid EI, during an outbreak or at times of the year when risk is highest, don’t travel with your horse. Keep a close watch for any changes in your horse.